. 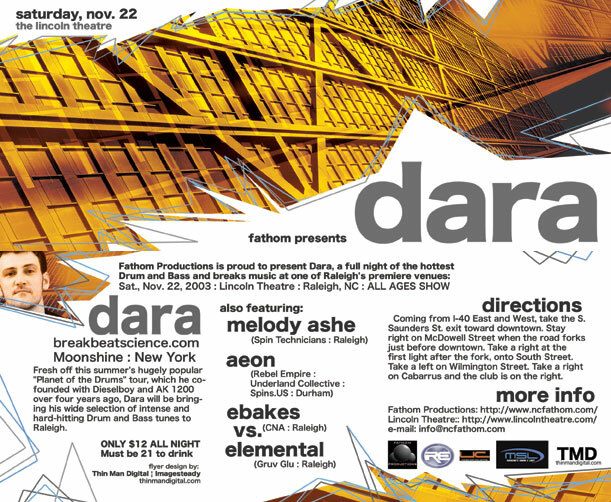 :: ncfathom.com - Dara: Nov. 22, 2003 ::. Receive e-mail notification of our events. Dara (Breakbeat Science : Moonshine : New York): Fresh off this summer's hugely popular "Planet of the Drums" tour, which he co-founded with Dieselboy and AK 1200 over four years ago, Dara will be bringing his wide selection of intense and hard-hitting Drum and Bass tunes to Raleigh. 9 PM - 3 AM. Coming from I-40 East and West, take the S. Saunders St. exit towards downtown. Stay right on McDowell Street when the road forks just before downtown. Take a right at the first light after the fork, onto South Street. Take a left on Wilmington Street. Take a right on Cabarrus and the club is on the right.